Footage obtained by Turkish broadcaster A Haber late Monday showed Saudi consular personnel burning documents a day after Jamal Khashoggi disappeared. 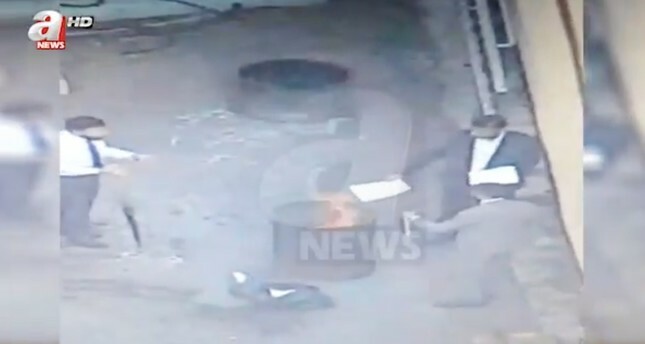 The footage purportedly recorded in high-rises surrounding the consulate's compound in Levent district of Istanbul, shows two men burning papers in a trash container. By nightfall on Monday, Turkish police began searching an underground car parking garage in Istanbul's Sultangazi district. Surveillance footage on TRT also showed what Turkish security officials described as suspicious actions, including an image of a man moving a bag from one vehicle to another. Five Turkish employees of the consulate also gave testimony to prosecutors the same day. Istanbul's chief prosecutor had summoned 28 more staff members of the Saudi Consulate, including Turkish citizens and foreign nationals, to give testimony. Some Turkish employees reportedly said they were instructed not to go to work around the time that Khashoggi disappeared. Khashoggi went missing on Oct. 2 after he entered the Saudi Consulate in Istanbul. The kingdom's announcement that Khashoggi died in a "fistfight" was met with international skepticism, sparking allegations of a cover-up to absolve the 33-year-old crown prince of direct responsibility. On the day of Khashoggi's disappearance, 15 other Saudis, including several officials, arrived in Istanbul on two planes and visited the consulate while he was still inside, Turkish police said. The 15 Saudis knew Khashoggi would enter the consulate to get a document he needed to get married, and once he was inside, the Saudis accosted Khashoggi, cut off his fingers, killed and dismembered the 59-year-old writer, according to media reports. All of the identified individuals have since left Turkey. Shortly after the 15 Saudis were identified, surveillance video of a man in Khashoggi's dress shirt, suit jacket and pants surfaced. A Turkish official described the man as a "body double" and a member of the Saudi team sent to Istanbul to target the writer. The man was seen walking out of the consulate via its back exit with an accomplice, then taking a taxi to Istanbul's famed Blue Mosque, where he goes to a public bathroom, changes back out of the clothes and leaves. He later eats dinner with his accomplice and goes back to a hotel, where the footage shows him smiling and laughing. Last week, a leaked photo apparently taken from surveillance footage also showed Maher Abdulaziz Mutreb, a member of Prince Mohammed's entourage seen on trips to the U.S., France and Spain this year, at the consulate, just ahead of Khashoggi's arrival. The footage and photos have strengthened claims that there was a premeditated plot to kill Khashoggi.